The 33-foot (10-meter) tall MOMO-2 fell to the ground and exploded shortly after its launch from a test site near the town of Taiki on Japan's island of Hokkaido. IST recently released a high-definition multi-camera video of the launch, and now the company has released to the public another recording of the failed liftoff—this time, shot by high-speed cameras at the rate of 1,000 fps. Developed by Photron, the FASTCAM cameras were set at two positions at the launch pad in order to record the whole sequence of the launch from the upper and lower angles. Unexpected fire emerging from the side of the vehicle's injector is clearly observed in these super-slow videos. Given that the exact cause of the launch failure is still being investigated by IST, the new footage could be helpful in determining what triggered the malfunction. Takahiro Inagawa, IST's CEO, told Astrowatch.net that verifying those videos from high-speed cams leads to the initial assumption that the cause of the failure was in the side jet thruster. "IST is currently conducting reproduction experiments of the malfunction. Later, IST plans to upload the telemetry and other data found onto GitHub to share the knowledge of cause investigation," Inagawa added. 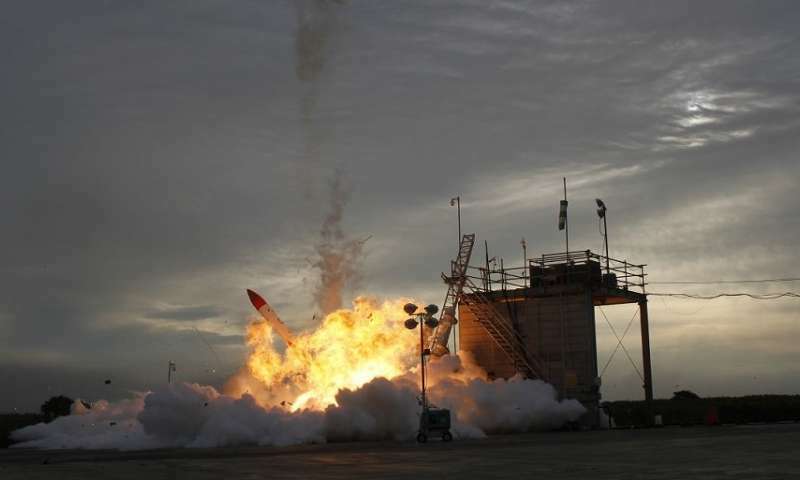 The MOMO-2 rocket launch was IST's second test mission that ended in failure. The first rocket developed by the startup, MOMO-1, was launched in July of 2017 but communications with it were lost about a minute after it had left the pad. Despite two setbacks, the company is currently working toward its next mission—MOMO-3. However, although the exact date of the launch has not been disclosed yet, Inagawa recently revealed that MOMO-3's flight should be expected within months. The flame coming out of the nozzle during the successful portion of the takeoff is amazingly beautiful.